Soul Food for Hungry Adult Communities: 2nd Sunday of Easter, April 7, 2013. 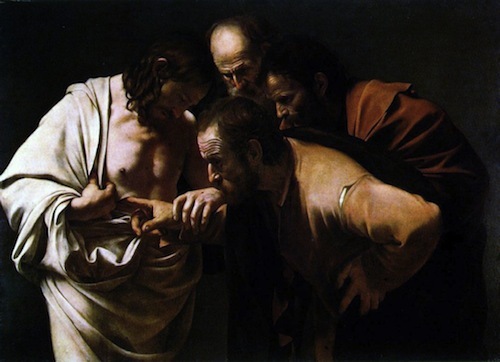 ‘Doubting Thomas’ is the person put before us, in the Gospel for this Second Sunday of Easter. It’s from Chapter 20 of St. John,- the first account of the Resurrection, in John. ‘Change the name and the story is about yourself’,- a famous phrase of Cicero, about any story. Let us be Thomas, as we read it again (John 20:verses 19-31). I am Thomas. I will not believe all this stuff that the others are going on about,- the women telling us about the empty tomb, the others of the twelve (well, eleven if you count Judas out, as he has died),- they all going on about seeing the Master alive, about his ‘appearing’ to them, in the upper room, in the garden near the tomb, and so on. Two others say they met him on the road out of Jerusalem. I’m not going to swallow all that stuff. I need to see for myself, to actually put my fingers into the wounds in his hands from the nails, and my hand into his side where the soldier pierced him after he died. Only then might I begin to believe. A week later, I’m still unbelieving. I just don’t get it. Here I am in the same Upper Room, where we had had our last supper with him before he was taken and put to death. We hide here, and we keep the doors locked, because we are afraid that at any moment the authorities might come and take us away also, and condemn us and kill us on crosses too. And then, the Master is here! He’s looking at me. He’s calling me over,- ‘Thomas’ he says, calling my name. He holds out his hands to me, and I see the wounds, and hesitantly reach out and place one finger in a wound. He then shows his side to me, he pulls back his cloak, and there I can see the wound clearly visible,- the place where they pierced him. I don’t need to put my hand into that wound. I know it is the Master. It is Jesus, alright, and he’s looking at me still, with gentleness, with understanding of my difficulties. He just takes my two hands, and I burst out to him ‘My Lord, and my God!’ I couldn’t keep it in. It was truly the Master, alive, and with us, and speaking to us. The others ribbed me about it, later, but I don’t mind. I did what I had to do. I asked hard questions, and I searched for the truth. And I found Him! Call me ‘Doubting Thomas’ all you like- I don’t mind one bit. I’m proud of the title, now. And maybe, if you can bring yourself to take my word for what happened on that day, you too might believe in the Master, you too might, in your own time, look at him and say with all your heart ‘My Lord! and My God!’ For he is both. Be gentle with yourself, and with anyone who has doubts and questions. We all journey at different paces. The Master is patient, and is waiting for you. God bless you, on your journey! Continue to have a truly happy Easter time. Christ is Risen! he is truly Risen! My Lord, and my God. ← Happy Easter to all our friends!